There is nothing like drinking maple syrup with your dinner—in a beer, that is. Barley Days Brewery in Prince Edward County specializes in crafting seasonal beers for residents to enjoy with festivities. 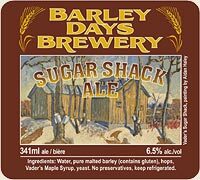 With spring’s arrival, the sap begins to flow and Barley Days offers customers a Sugar Shack Ale, brewed with maple syrup from nearby Fosterholm Farm. Judging by the reaction from customers on the brewery’s Facebook page, the season-specific beers are a huge hit. Stocks of the Sugar Shack Ale sold quickly at the annual Maple in the County event and the brewery has almost sold out its entire 2011 batch. The company also offers a Yuletide beer made with County cherries, a harvest ale made with local wheat, a dark ale, a Loyalist summer ale and a May bock for consumers who still desire a craft beer once the maple syrup has dried up. Founded by Christopher and Norah Rogers, Barley Days offers local residents, tourists and LCBOs with a great-buy local option. Supported by sales driver Donna Sauvé and brewmaster Alex Nichols, the local business have created a winning recipe for success. Donna Sauvé on tap at Barley Days Brewery. Situated at an old dairy farmhouse outside Picton, Barley Days has based its label and brewing on historical roots. In the 19th century, barley and hops were the cash crops of the County. The American demand for these ingredients was high and the settlers catered to the demand. Barley Days celebrates these boom years by reaching back to the days when barley enabled the County to flourish. With the recent winery expansions, the County is once again reliving the Barley Days. As a craft brewery, Barley Days uses local, high-quality ingredients to cut down on shipping costs; yet, this allows the brewery to offer their seasonal, one-of-a-kind brews. The brewery continues the local theme by using paintings by the famous artist, Manly MacDonald. Four different bottles use MacDonald’s paintings, which were famous for their depictions of area landscapes. 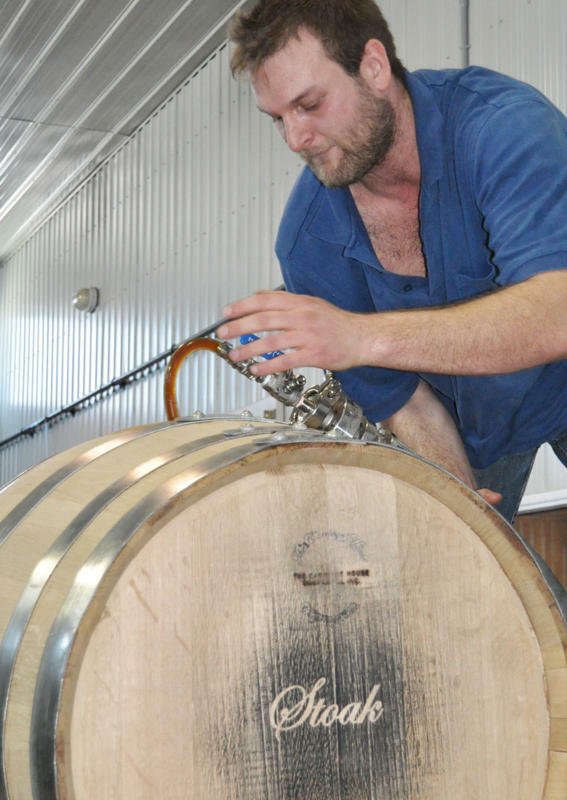 When MacDonald’s images cannot be used for bottles, Barley Days employs local artists, such as Aidan Haley, whose work adorns the bottle of the 2011 Sugar Shack Ale. Each year the brewery showcases these local talents when the various seasonal beers arrive in stores. 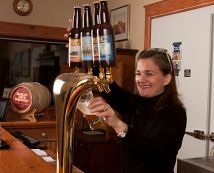 The beer is available on tap at nearby Waring House (same proprietors) which offers tourists and locals a chance to taste the seasonal beers along with a meal. Consumers can also find the brew at many Quinte area LCBOs, although selection may be limited to the year-round brews. Barley Days Brewery will be a Featured Craft Brewer at The Great Canadian Cheese Festival taking place June 4-5 at Crystal Palace in Picton, in the heart of Prince Edward County, Ontario’s fastest-growing culinary destination and Canada’s newest VQA wine region. Barley Days beers will be available for tasting at the All-Day Cheese-Tasting Seminar Program and Cooks & Curds Cheese Gala on Saturday and during Artisan Cheese & Fine Food Fair on Sunday. Troy Stewart, a recent graduate of the Post-Grad Public Relations Program at Loyalist College looking for a career in PR, maintains a blog called PR with Troy. He likes his cheese and he likes his beer. 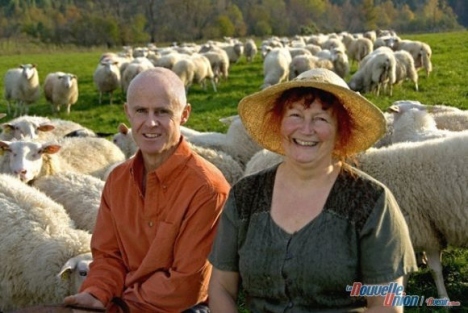 Alastair MacKenzie and Lucille Giroux with their sheep at La Moutonnière in Quebec. For Lucille Giroux, Fromagerie La Moutonnière was a second home, and cheesemaking a second career. More than 30 years ago, Giroux and her husband moved from Montreal to a farm three hours outside the city, so they could raise their children in the Quebec countryside. Giroux, who had worked as a nurse in Montreal, began raising sheep and selling both their meat and wool. A few years later, she began milking the animals and making cheeses. With her business expanding, Giroux took on Alastair MacKenzie as a business partner in 2000. He oversees the animals and farm, while Giroux manages the cheese side. Much like Giroux, MacKenzie got into the cheesemaking business in a roundabout way. He grew up in New Zealand and was a third-generation sheep farmer on the family farm. MacKenzie met his wife, Karine, in New Zealand; a native of Quebec, she was a university student studying abroad. When she finished her studies in New Zealand, Karine returned to Quebec, and after seven years of dating long-distance, MacKenzie moved to Quebec in 1999. Wanting to put his farming skills to use, MacKenzie searched for a suitable job in Canada. It was Karine who first heard about La Moutonnière. She read an article about Giroux and her business while sitting in a dentist’s waiting room. MacKenzie visited Giroux on her farm, and after discussing the business, they agreed to become partners. The sheep herd now numbers 150. Three years ago, La Moutonnière built a brand new cheese plant. While 95 per cent of their products are made with sheep milk, they’ve begun experimenting with goat and buffalo milk as well. Giroux and MacKenzie are dedicated to raising “100 per cent happy sheep.” MacKenzie explains their sheep live a good life: they move freely, and go outside whenever the Quebec weather allows it; they have enough to eat and drink; and they’re well respected by their owners. MacKenzie believes consumers today are aware of problems in the food industry, and many now want to know how farm animals are treated. There is a movement toward artisanal products, and a concern for animal welfare. At La Moutonnière, the focus is on creating quality, artisan products and tending to the welfare of the animals that allow them to run their business. 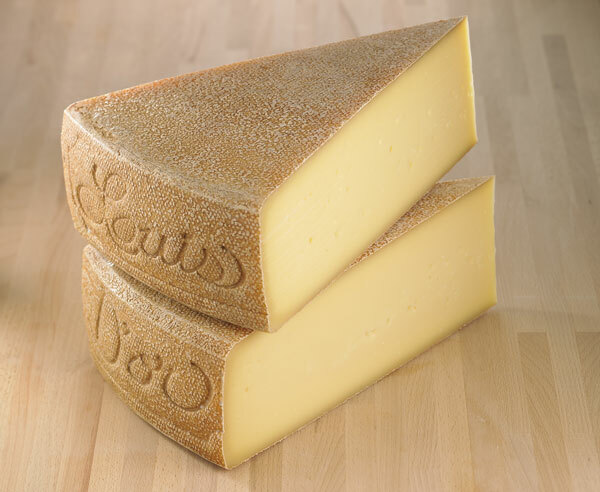 Le Fleur des Monts – pasteurized pressed sheep’s milk cheese aged from 3 to 9 months. Rich tasting, with notes of almond. Le Sein d’Hélène – blend of sheep and Jersey cow milk, aged from 2 to 4 months. Creamy, with a slight acidity. Le Bleu – mild-tasting sheep’s milk bleu. Slightly sweet with the sharpness typical of bleu cheeses. Feta – fresh sheep cheese stored in olive oil and fresh herbs. Ricotta – fresh sheep cheese made with whey. It is smooth, creamy and sweet. Le Neige de Brebis – mild, fresh cheese made from whey. Le Cabanon – aged soft cheese, wrapped in an alcohol-soaked maple leaf. It’s a full-bodied cheese with notes of hazelnut and spice. Le Foin d’Odeur – soft washed-rind cheese. It’s a creamy, runny cheese with delicate flavours. La Moutonnière also sells homemade yogurt, cream, sheep’s milk and desserts. La Moutonnière cheeses are sold at the farm’s creamery in Ste-Hélène de Chester, Québec; at Jean-Talon market in Montreal; at select grocery stores in Quebec and Eastern Ontario; and at the Leslieville Cheese Market in Toronto. La Moutonnière will be a featured cheesemaker at The Great Canadian Cheese Festival taking place June 4-5 at Crystal Palace in Picton, in the heart of Prince Edward County, Ontario’s newest wine region and fastest-growing culinary destination. Phoebe Powell, senior roving reporter at CheeseLover.ca, is based Ottawa. Her last blog was on Beau’s All-Natural Brewing Company. Black River Cheese Company is one of the oldest cheesemaking operations in Eastern Ontario. In fact, it will celebrate it’s 110th birthday on June 4-5 while The Great Canadian Cheese Festival takes place nearby. Black River Cheese is one of four stops on the Cheese Tour taking place on June 3, the day before the Festival. When it was started in 1901 by a group of local farmers, it was one of 60 cheesemakers operating in Prince Edward County. Now, it is one of only two, joined by newcomer Fifth Town Artisan Cheese in 2008. The fact that Black River Cheese has been around for so long means they are clearly doing something right, yet the other 59 cheesemakers who have since vanished prove that this isn’t always an easy business. In 2001, shortly after celebrating their 100th anniversary, an electrical fire devastated the historic facility. In the spirit of Black River Cheese Company’s resilient founders, the 6,000-square-foot creamery was rebuilt, and opened again for business just one year later. Situated on the banks of Black Creek near the village of Milford, a stop at Black River Cheese is a popular destination for visitors to the area. The location is stunning, the river teeming with birds and wildlife, but it’s really the cheese that makes the crowds come calling. And the ice cream! Black River Cheese is still a small co-operative, controlled by local farmers and dedicated to preserving a tradition of making superior cheese. They pride themselves on old-world craftsmanship, producing 100% natural cheeses with no artificial ingredients. Rennet-free and naturally aged, Black River Cheese only uses locally produced milk, opts for vegetable dyes, and never uses modified milk ingredients (MMI). Black River’s cheesemaker is Brad Reid, a second-generation cheesemaker. County-born, he’s been at the company for six years, and in 2010 landed Black River a 3rd place prize at the British Empire Cheese Show with its Mild Cheddar. Reid is currently developing a few new recipes, so keep a lookout for some new cheeses that he’s keeping secret for now. Curd – coloured, white or garlic, and makes a popular snack for visitors. Lucky for me, Black River Cheese is just a short drive from my home, so I stopped in and tried a few samples. The Maple Cheddar has a golden hue and is crumbly, rich and sweet. It’s no surprise that this unique variety is one of their top-sellers, especially in an area so renowned for maple syrup production. The Six-Year-Old Cheddar I tried was ivory in colour, and was hard and crumbly. It had an intense bite and a slight crunch to it. One of the other best-selling cheeses is the Marble Cheddar. With its typical mottled colouring, it was firm and chewy with a mild tanginess. Black River Cheese is for sale at its scenically located factory outlet, as well as at health food stores and specialty sections of supermarkets. Black River Cheese will be a Featured Cheesemaker at The Great Canadian Cheese Festival taking place June 4-5 at Crystal Palace in Picton, in the heart of Prince Edward County, Ontario’s booming new wine region and fastest-growing culinary destination. A writer living in Prince Edward County, Krista Dalby runs Small Pond Arts with her husband. Read their blog at smallpondarts.blogspot.com. Tonight’s the night! 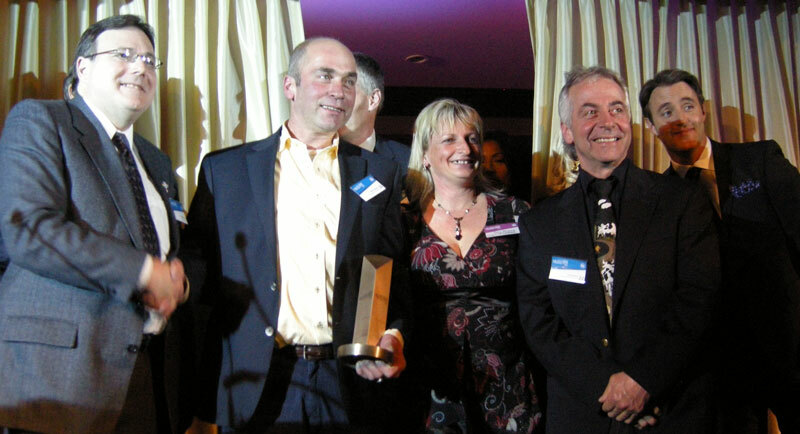 The winners in the Canadian Cheese Grand Prix will be announced at a Gala of Champions in Toronto this evening. I’m aiming to provide a live news feed on Twitter starting soon after six o’clock and continuing until the Grand Champion is named. The reason there’s so much excitement around here about the Grand Prix is that the winners will presented at The Great Canadian Cheese Festival upcoming on June 4-5. It will be the first opportunity for cheese lovers to taste the winning cheeses in one place at one time. During the Artisan Cheese & Fine Food Fair on Festival Sunday (June 5), Deborah Levy of Dairy Farmers of Canada will lead a tutored tasting of the winners. They’ll also be featured the Cooks & Curds Cheese Gala on Festival Saturday (June 4). Click here for a look at the cheeses in the competition organized and sponsored by Dairy Famers of Canada. They represent the best in cow’s milk cheeses for sale in the country this year. Georgs Kolesnikovs, cheesehead-in-chief at CheeseLover.ca, is the founder and director of The Great Canadian Cheese Festival. Judgment time at Top Chef Canada: Cheese is up next. Former Susur Lee Sous-Chef Dustin Gallagher’s playful tussle with a large block of fromage in Episode 1 gave Top Chef Canada viewers a heads-up on a key ingredient in upcoming Episode 2: Canadian cheese! The chefs are given a range of Canadian cheeses from coast to coast. Will they use gouda from Gort’s Gouda Cheese Farm in B.C., Alberta’s Sylvan Star Cheese, or Ontario’s Thunder Oak Cheese Farm? Cheddar from Quebec’s Perron or Wilton’s Cheese Factory in Ontario? Perhaps they will create from a hodgepodge of cheeses? Selecting the wedges they know, the culinary contenders craft distinct plates for a cocktail party of 50 guests who help the judges in their selection of the second chef to be asked to pack his or her knives and go. The most watched original premiere in Food Network Canada’s history, Top Chef Canada continues to vigorously protect its trade secret: the element of surprise. The cheeses procured and showcased? Guarded jealously. News of a guest judge from the cheese industry? Mum’s the word. We’ll have to watch Monday’s episode to find out! It’s amazing how tightly shrouded in secrecy the producers of Top Chef Canada like to keep their show before it airs. Witness the scant information CheeserLover.ca was able to obtain for the above report. No mention of even the basics, such as Dairy Farmers of Canada being the sponsor of the episode and provider of the cheese. Even cheese and wine expert Julia Rogers, a good friend and supporter and presenter at The Great Canadian Cheese Festival we’re organized, wouldn’t say boo when we emailed for confirmation about her serving as the guest judge on Episode 2. “Sorry, but I signed a confidentiality agreement as thick and detailed as could be. I will not be able to comment on anything you ask prior to the show airing, except to say that the challenge involved Canadian cheese,” she emailed. Top Chef Canada spoiler alert . . . On Monday, watch me judge contestants’ cocktail party cheese offerings with as much integrity as possible, while wearing false eyelashes and losing the microphone down my dress. Monday’s episode of Top Chef Canada on the Food Network will be all about CHEESE! The episode will be the main ingredient in the two key challenges in the show and will be featured prominently throughout the show. The first challenge of the show is the “Quickfire Challenge” that measures specific skill sets of the competitors. For the challenge, a table full of cheeses made from 100% Canadian Milk will be unveiled to the competitors and they will be asked to create a dish using as many cheeses as they wish and then describe the dish and the inspiration behind it. In the “Elimination Challenge,” the competitors will be divided into teams and will be given a specific Canadian Cheese and a meal course to work within. The chefs must then create a dish around their kind of cheese that works within the corresponding course in the dinner service—which is at an actual function. This challenge will showcase the versatility and variety of Canadian cheese. We’ve posted the video clip that is posted on the Food Network Canada website at the top of this post. Those who are unable to watch the show Monday night will be able to view it on the website Tuesday. Georgs Kolesnikovs is Cheesehead-in-Chief at CheeseLover.ca. He’ll have a tape in the old VCR on Monday night as he and SO will be at the Drake Hotel taking in the Battle of Paté organized by Ivy Knight as part of her 86’d series of fun food events. A multi-day, multi-faceted event like The Great Canadian Cheese Festival relies on many volunteers to make it all happen. We’re issuing a call to culinary students from nearby colleges and people in the community to join the effort. We’ll need a wide range of skills and experience: registration staff, parking attendants, servers, hosts, three cheese-prep teams for the tutored tastings, eight culinary teams to work with chefs, set-up and tear-down crews, groundskeepers and many others. We need more than 50 worker bees but we’ll also need a handful of take-charge people to lead teams of volunteers. It will be work and it will be fun—but you won’t go home empty-handed. The range of benefits for volunteers includes colourful Cheese Festival T-shirts, admission to Festival functions and lunch on Saturday according to hours worked, admission to the Cheese Fair & Artisan Food Market on Sunday and the opportunity to taste more than 100 Canadian artisan and farmstead cheeses as well as sampling artisan food and, for those of the age of majority, fine wine and craft beer. PLUS: Discounted admission to the many attractions listed at Attractions Ontario. If you have any questions about volunteering, please email info@cheesefestival.ca. Georgs Kolesnikovs is founder and director of The Great Canadian Cheese Festival, the first time ever in Canada when there is one event that cheese lovers can attend to learn, talk, taste—and purchase—Canadian cheeses from coast to coast. More than 100 artisan and farmstead cheeses represented, made from Canadian cow, goat, sheep and buffalo milk.